Sanctuary Bistro in West Berkeley opened last week, Eater SF reported. The vegan, gluten-free spot’s opening menu features dishes from a variety of cultures, much of it familiar fare — think eggplant manicotti, portobello mushrooms with dirty rice and cornbread, and gluten-free waffles for brunch. Owners Barry and Jennifer Jones Horton plan to donate 5 percent of their profits to animal sanctuaries. According to Inside Scoop, Curbside Creamery, which has been operating from an ice cream cart at the Temescal and Grand Lake farmers' markets, opened its brick-and-mortar store last Friday in the Temescal Alley. The creamery is known for its old-timey ice cream sandwiches (both regular and vegan) and its vegan, nut-based ice creams. 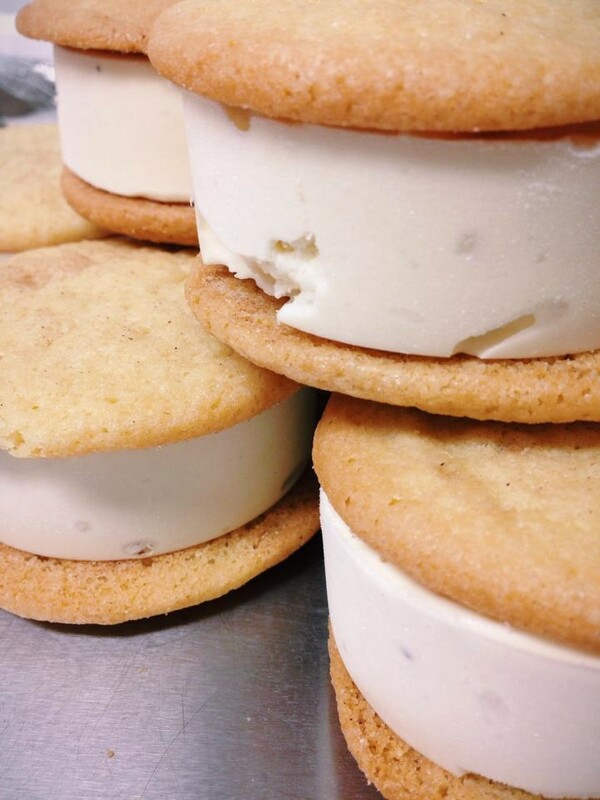 Curbside Creamery's cinnamon ice cream and snickerdoodle cookie sandwiches. Belly in the Uptown has also recently opened, Eater SF reported. Owners Alice Woo and Alan Chun will be serving LA-style Asian fusion tacos and wraps using fillings like honey-roasted pork belly and panko-coated fried fish. Oh lordy, here’s something to perk up your Mondays. According to Tablehopper, Ozumo in Oakland is offering Sushi Monday, a $40 all-the-sushi-you-can-eat option at its sushi counter, and this includes fried chicken and pork ribs. Tablehopper also reported that Periscope Cellars at downtown Oakland’s Swan’s Marketplace is currently closed as they are reincarnated as Deep Roots Restaurant and Wine Bar. Periscope wines will still be poured, alongside other locally made wine and beers. There will also be cocktails — yes, Swan's Marketplace is getting a full bar. The opening menu features Taylor’s sausages and other bar bites. Last Friday, Peet’s Coffee announced its acquisition of San Rafael-based Mighty Leaf Tea, an artisanal tea company with a strong presence at many local grocery store. Not much will change for Peet’s or Mighty Leaf tea drinkers — Peet’s plans to continue to produce its own line of teas, and Mighty Leaf will continue to operate independently. For Peet’s, the acquisition is another step in the company’s ongoing growth. The company began its largest expansion ever last year, with plans to open sixty stores by the end of this year. And finally, get ready for a new lunchtime grab-and-go spot in the Uptown: Taiwan Bento plans to open its doors on August 11. The new spot’s menu features Taiwanese beef noodle soup and the kind of lunchboxes popular in owner Stacy Tang’s native Taiwan. Check out the Express's full write-up for more.